49 m above sea level, and with an extension of 11 km2 (1), Ullastret is found in the region of the Baix Empordà (2). Near to La Bisbal d’Empordà (capital of the region), it is located on the plain of the lower river Ter, crossed by the river Daró (3). 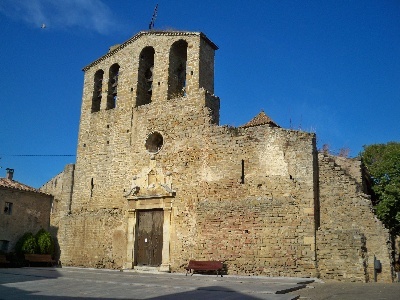 The personality of Ullastret passes through the archaeological site of the Iberian settlement, but also through the remains from Roman and Medieval times; examples are the walls, the church, the market or the Gothic square. One of the headquarters of the Archaeological Museum of Catalonia, the Iberian city of Puig de Sant Andreu is one of the most important archaeological sites of the state in its category: showing the walls, streets, homes and temples of the its inhabitants, the tribe of the Indigetas, who lived in the area during the 6th century B.C. Those who want to enjoy one of the most impressive views of the Baix Empordà cannot omit Ullastret, which from the archaeological site rewards one with a landscape unique in the area. The beach of Castell de Palamós is situated very nearby. A visit to Ullastret is the perfect excuse to taste some of the typical dishes of the Empordà and Catalan cuisine. Standout specialities include charcoal-grilled black rice, rockfish suquets, meats like young goat, roasted or charcoal-grilled, or deserts like ricotta-style-cheese with honey and dried fruit and nuts.